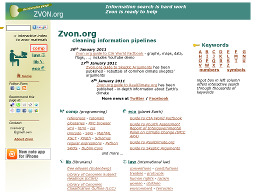 Zvon.org Covers different aspects of XML, ranging from a basic introduction to programming references and advanced tutorials. A good place to learn more about the versatility of XML. 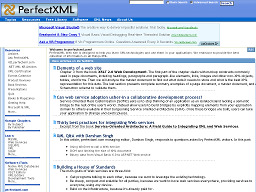 PerfectXML For the more technically oriented, PerfectXML, is a great site. The site's main focus is XML and related technologies for business people and technologists - both from a practitioner and learner perspective. To that end, PerfectXML provides thousands of quality, well-organized links as well as other services in the form of articles, tutorials, book excerpts, news updates, searchable Knowledgebase articles, XML-jobs search, & much more. 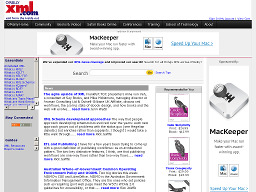 XML.com By O'Reilly, features a rich mix of information and services for the XML community and how this technology can solve real-world problems in information management and ecommerce. Good source for RSS info as well. PerfectXML Covers different aspects of XML, ranging from a basic introduction to programming references and advanced tutorials. A good place to learn more about the versatility of XML. 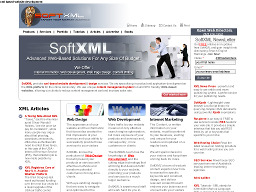 SoftXML.com Have been around since the inception of XML and specialize in the development of XML projects. The site offers a variety of XML tutorials and guides along with other website programming and development tutorials.